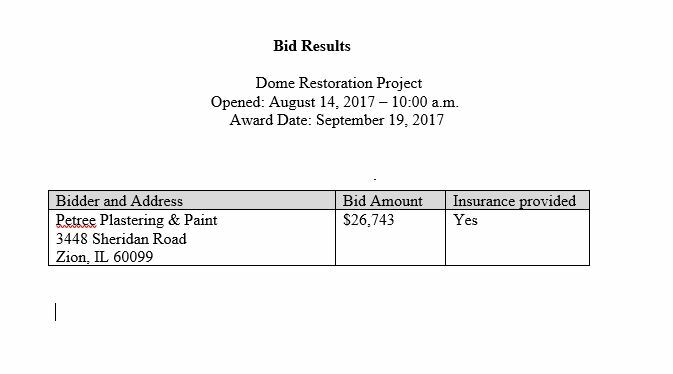 for the Historic Dome Restoration Project. 2828 Sheridan Road, Zion, Illinois 60099. Proposals shall be submitted in a sealed envelope, with the name and address of the company and with the words “HISTORIC DOME PROJECT” Sealed proposals are to be submitted no later than 10 A.M. Monday, August 14 2017 to Diane Burkemper, City Clerk, Zion City Hall, 2828 Sheridan Road, Zion, IL 60099. Robert Surano, Lead Inspector 847-746-4026 bobs@zion.il.us . On Site visit will be held on August 11, 2017 @ 10 A.M. at the dome located at the corner of 26th Street and Sheridan Road, Zion, IL 60099. All contractors must comply with the applicable Illinois law requiring the payment of prevailing wages by all contractors working on public funded projected and contractors must comply with the Illinois Statutory requirements regarding labor including Equal Employment Opportunity Laws. Each company in submitting a proposal signifies his intentions and good faith to enter into a contract with the City of Zion, Illinois, should they be awarded a contract. The City of Zion reserves the right to reject any or all proposals or waive any irregularities.